To get an accurate lumber calculation, you have to consider your fence's length and design. Enter your preferences below and then, use ImproveNet to connect with an experienced fencing contractor near you. *10% allowance for waste included. This is an estimate. Get accurate wood fencing quotes. It's free! When many of us picture the American Dream, a wood fence is surely in the portrait. Beyond adding that sense of privacy we all want in our home, a new fence, no matter the material, increases the value of your home, deters intruders, keeps pets and children nearby and helps eliminate outside noise. Why you install a fence is easy. How much wood fencing you need is another obstacle all together. Luckily, you've come to the right place. Use our wood fence calculator above to determine exactly how much wood you need for your new fence. Once you enter all your specs, you'll see how many post, rails and boards are required. Of course, these numbers will go a long way in determining your final wood fence installation cost. 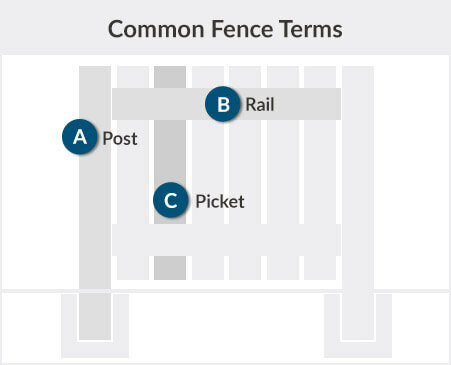 Fence Posts: Posts are generally set 8 feet apart from each other. Number of Posts = Fence Length/8. Posts are typically sold in 8-foot or 16-foot sections. Sections set longer than 8 feet apart will sag. Rails: If the fence has rails, they should be 8 feet long and set between the posts. Fence Height: Add 1/3 to the height of the fence because 1/3 of the fence should be buried for stability. Ends: Unlike a corner, ends only have a single section of the fence leading into it. Materials: Always buy 10% extra to ensure a single trip to the lumberyard. Of course, this affects your fence cost calculation. Gates: You can buy gates premade or build one out of wood. Three feet is standard for walkway gates, but 5 feet is recommended. 1. Preparation: Check with your city so you know exactly where you can and can not install the fence. Also, see if you have to pull permits. Then, call 811 so they can mark your property and utility lines. This ensures you don't cut electricity for the entire block. 2. Sketch the Fence: Lay out your fence with stakes at each corner and string in between. Then, use a long tape measure to determine your total wood fence length. 3. Number of Posts: As we said earlier, posts should be no longer than 8 feet apart from each other. Some homeowners go with 16 feet, but if you do, your fence will not be as sturdy. If you go with 8 feet, divide your fence length by 8 to get the total number of posts. Therefore, a 100-foot fence would require 12 posts. Always round down. 4. Fence/Posts Height: Most fences are 6 or 4 feet tall. However, 1/3 or 33% of the post should be buried into the ground. Therefore, if you're installing a 6-foot fence, make sure your posts are 9 feet high (multiplied by 1.5). If you're installing a 4-foot fence, make sure your posts are 6 feet high. Once you determine your post height, multiple that by the number of posts to get the total linear feet of post material. 5. Railing Material: If you're installing a 6-foot high fence, you need three rails. For a 4-foot fence, two rails will do. To determine how much railing material you need, take your fence length and multiply that by the number of rails required. For example, if you're installing a 100-foot fence that is 4 feet high, you need 200 linear feet of railing. 6. Pickets: If you're installing a wood picket fence, you need to know how many pickets to purchase. First, multiply your fence length by the number of posts. A 100-foot fence with 12 posts would equal 1,200. Then, add the width of picket to your desired gap between pickets. Many pickets are 5.5 inches wide and a common gap is 1/2 an inch. Add them together and you get 6 inches. Finally, dividing 1,200 by 6 gives you 200 total pickets. Note: With all calculations, add 10% to account for waste and mistakes. If you end up with additional wood, save it as it will surely decrease your fence repair cost down the road. There are other options besides picket fences. There's one final piece of information you need before you can install your new fence: type of lumber. 1. Pine: This type of wood is easy to work with and costs less than many other woods. 2. Cedar: Very popular, cedar fences are durable and come in various styles. 3. Cypress: Much pke cedar, cypress is less expensive and is insect-resistant. 4. Redwood: For a vibrant fence, choose redwood fencing. Beware, it does cost more than other fencing options. 5. White Oak: This is one of the strongest woods and is ideal for homes that see a lot of rain or snow. Installing a fence is a challenging project, but hopefully, with our wood fence calculator above, your fence installation job can move a little bit quicker than most. Fortunately, if you need help along the way, we can assist. Use ImproveNet to find fencing contractors in your town! for your Wood Fencing project.